The image to the right is a print image I made for the German signings. 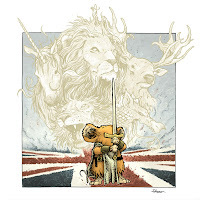 I kept in theme with the UK piece featuring a Guardmouse with heraldic animal imagery and the nation's flag. 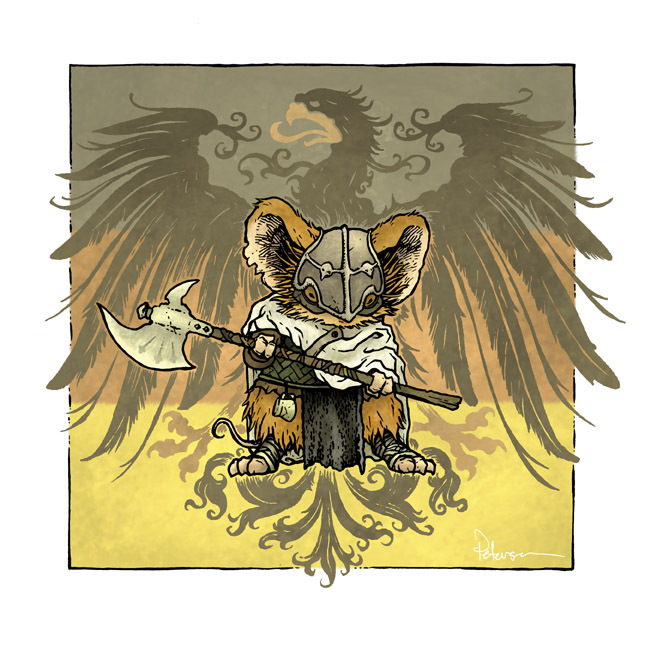 The Black eagle is a symbol of Germany, and I based the mouse's armor on designs of German Saxon armor. At this point, I do not intend to have copies of these prints available outside of these events and locations, though both images are slated to be in this year's sketchbook. 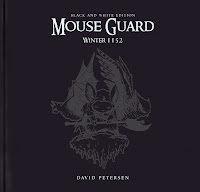 Winter 1152 Black & White Edition??? This book is long overdue, and I have a small update on it. 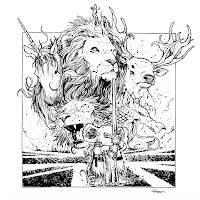 If you had ordered it ages ago when Archaia originally solicited it, you may be getting a notice from your local comic shop or online retailer that Archaia has canceled the order and the book. 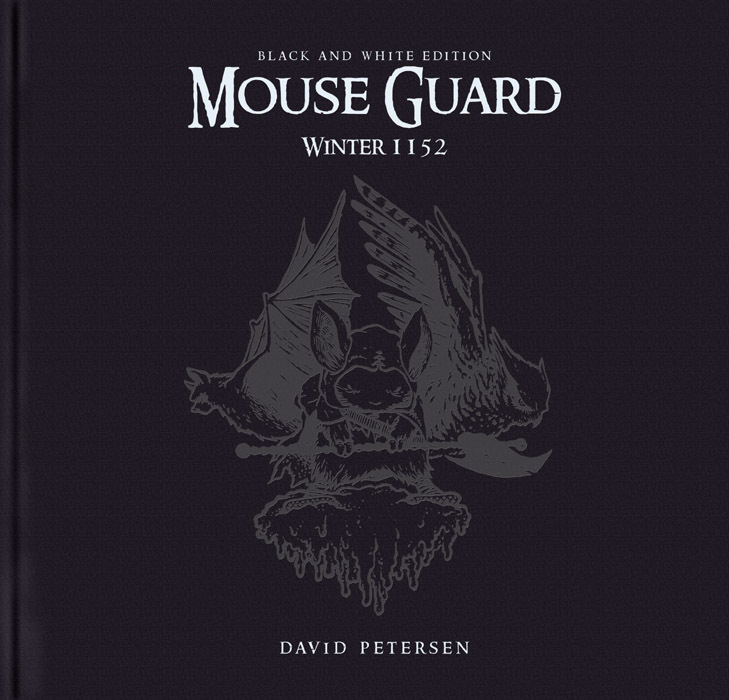 The orders have been canceled in part due to how old the solicitation was for them and that the book will need to be re-solicited to get current and accurate orders. The book is a tricky one to publish because of it's limited nature, it's costly overlay sheets, and it's larger size. We still have every intention to publish the book, IT has not been canceled, only the past orders. I will be talking to Archaia very soon and nailing down a new plan for release and try to get you all current information as soon as I can. Casey Crowe writes: "Was just rereading the third issue of Black Axe and, damn, those thorn bushes are ominous looking in the last panel! Anyway, felt inspired to give'em a shot myself and so I did this little drawing - hope ya dig it!" ---I do dig it Casey, I do indeed! 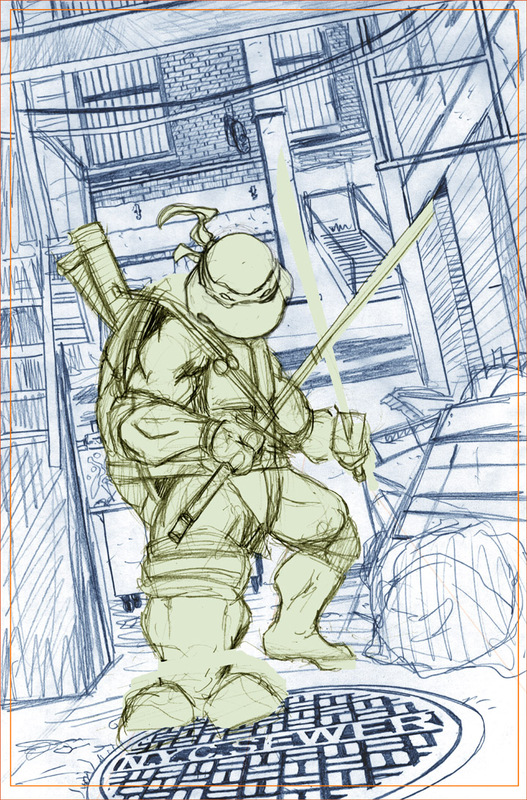 This is the last of my 4 Turtle covers for IDW (though I may do some more TMNT covers & work for them in the future). I had a melancholy feeling as I was working on this one. 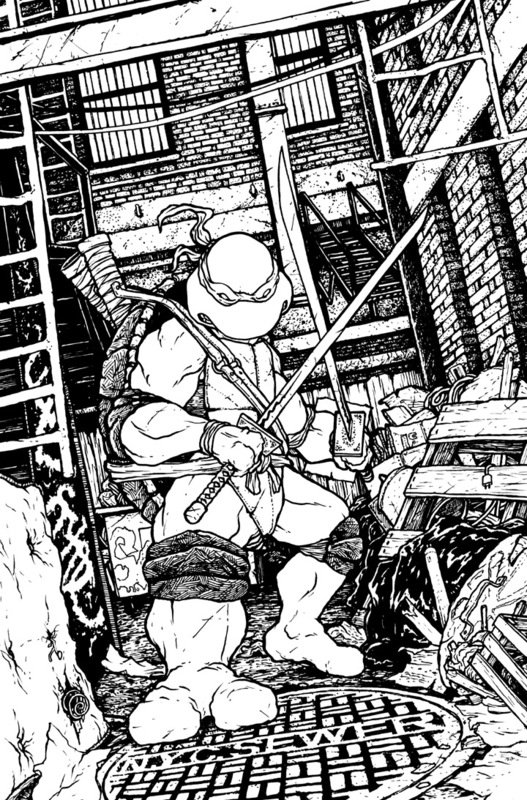 Bittersweet to be getting the chance to draw the Turtles (something I only dreamed of doing as far back as age 11) while at the same time finishing the job (at that point I didn't know if I was going to get the opportunity to do any more). To show Leo's commitment to his "work" I thought it would be good to show him in a rotten alley full of garbage. Someplace that would be uncomfortable for him, not only because he is above ground where he could be seen, but someplace even filthier than his sewer home. 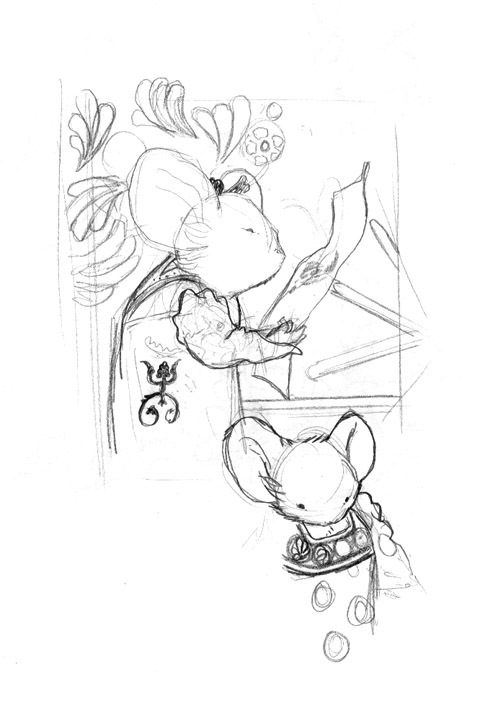 The piece started with two sketches in my sketchbook that I compiled in photoshop. One was of Leo, the other the alley. I found a photo online to use as reference for the details of buildings and fire escapes and ladders and clothes lines and sketched it out with omissions and the addition of trash (though you can see I added quite a bit more in the final art). 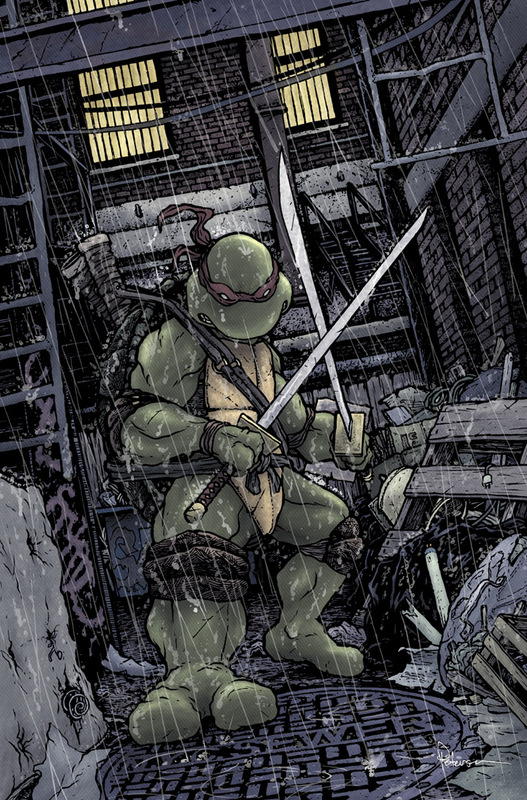 The section missing out of Leo's leg and his one sword were altered in photoshop. The sketch was a bit off (his one leg was too short and his sword was at the wrong angle and making an unfortunate tangent line with his head). The sewer cover I lightboxed from a photo of a NYC manhole cover I distorted in photoshop to match the angle and perspective of the alley. 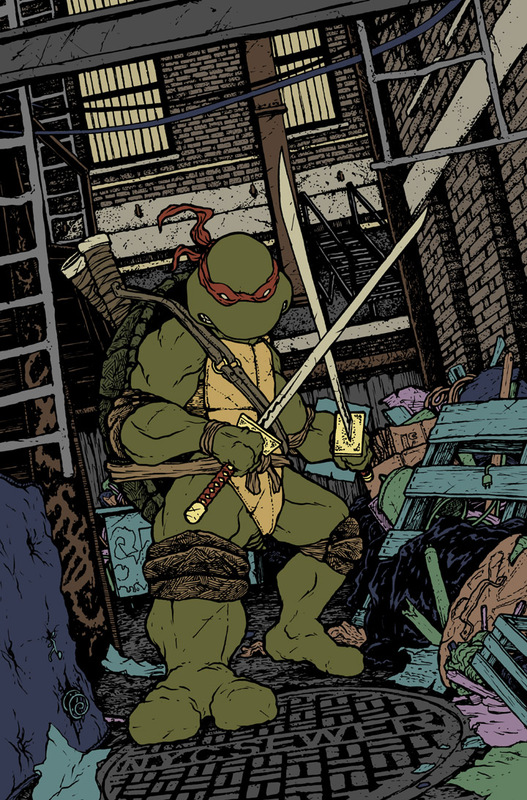 The folks at Nickelodeon, who have approval over the comic line, were worried about the background seeming boring (they were also the ones to point out the tangent between the sword and Leo's head). To hedge my bets with them I added a great deal more trash to the alley. I filled up both sides and made some of the items recognizable (like a small mattress or couch cushion, florescent light bulbs, garbage bags, a pallet, & fruit crates) while making the rest of the bulk just shapes that are obviously junk. This was all done in the inking stage. I also thought the scene would have more intensity (and make Leo more miserable) if it was raining. I placed my finished inked linework on my lighbox with a sheet of drawing paper over top. On the drawing paper I inked in rain falling, splashing, and running down the various objects in the alley. 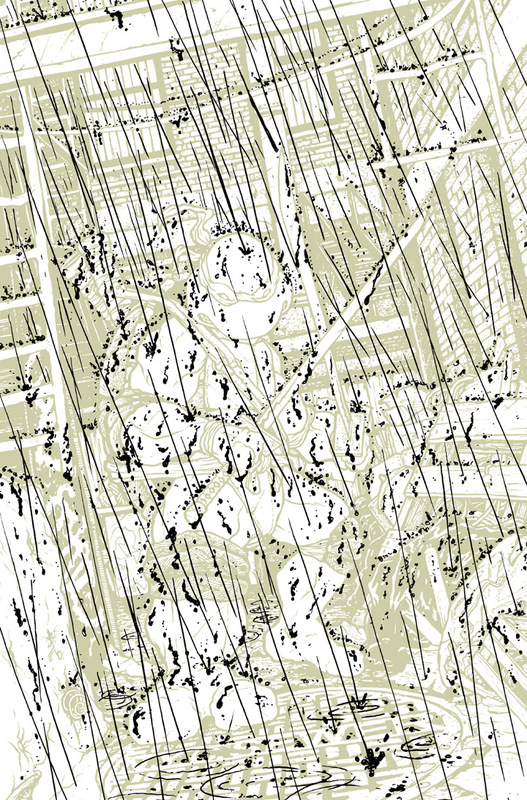 The inked rain is later scanned and adjusted to become semi-transparent light colored rain in the color file. 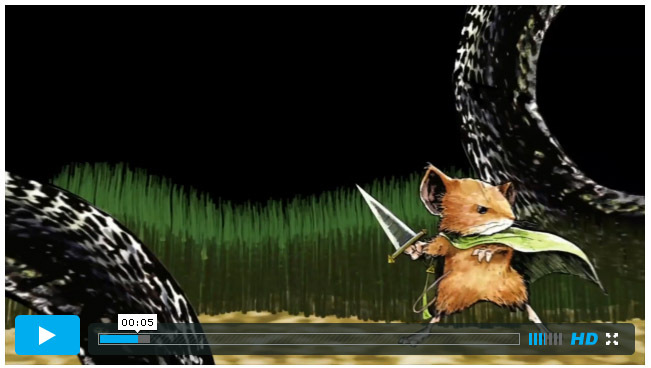 This is the same method I use when creating rain and snow in Mouse Guard. With the inked work scanned, I started flatting in the shapes. Flatting is the part of coloring where you distinguish color areas from one another: the green of his skin stops at the edges of his body, the red bandanna is different from his eye color, etc.. I have said in the past that the color choices are not even important, and here I used the wrong colors as I was flatting the garbage on purpose. Using these garish colors it's easier for me to see as I'm going that I have all those bits differentiated from one another and that I didn't miss any or that I didn't color outside the lines. The final color art is ready when I have done all the textures and shading and highlights. I've color corrected all the color choices, and dropped in the rain overlay. 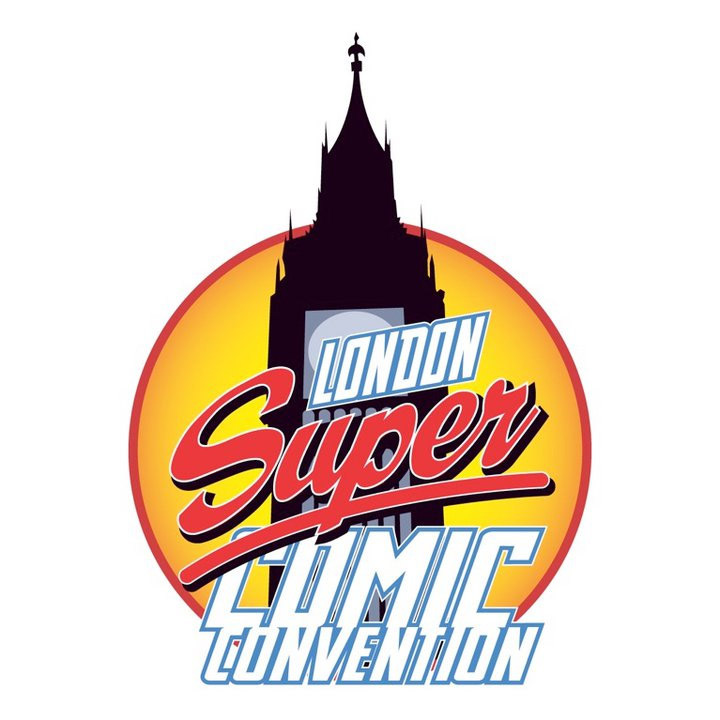 In February, I will be a guest of the London Super Comic Con's inaugural show. This will be my first UK convention! For the convention I'll be doing commissions a bit differently than I have in the past. I'm taking a pre-order list by email. The pieces will be inked 7" x 7" on 12" square bristol for £130. I will get these done before arrving at the LSCC, so I will need to cut off the list once I have the number of requests I can handle before we depart for the UK.You MUST be at the convention in person to pick up the piece (no proxy picker-uppers please). Email me to get on the list (payments will be handled through paypal in advance)*EDIT: The 7" x 7" Commission list is now closed* . 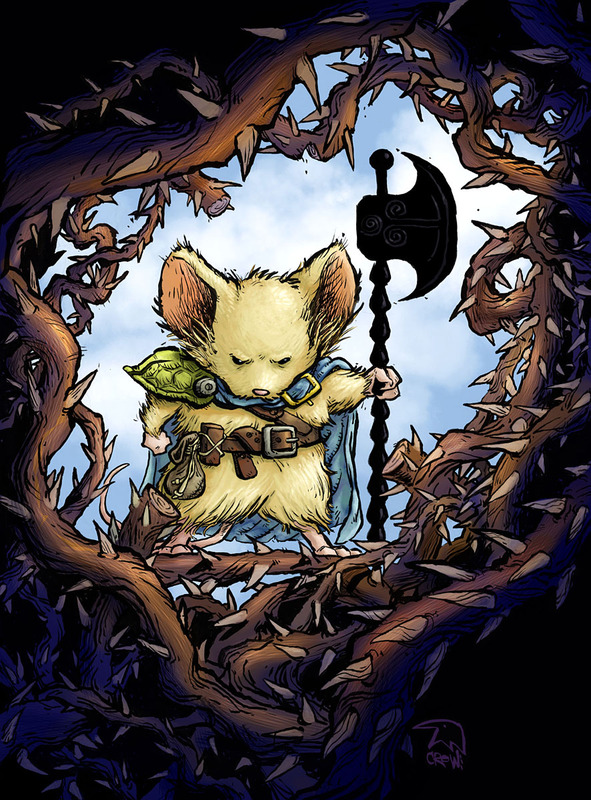 At the convention I will be signing books, selling prints, and doing much smaller commissions that are limited to 1 mouse + 1 profession/ with 1 weapon or tool for £40 (these will be limited and as time permits). In addition to the convention, I'll also be doing a signing March 1st at the London Forbidden Planet. And perhaps another London signing I'm waiting forconfirmation on. The process of this piece started with me wanting to do something very specific to the UK. I toyed with doing a mousey version of a few London architectural icons, but decided instead to do a piece that paid more respect to the UK than that. 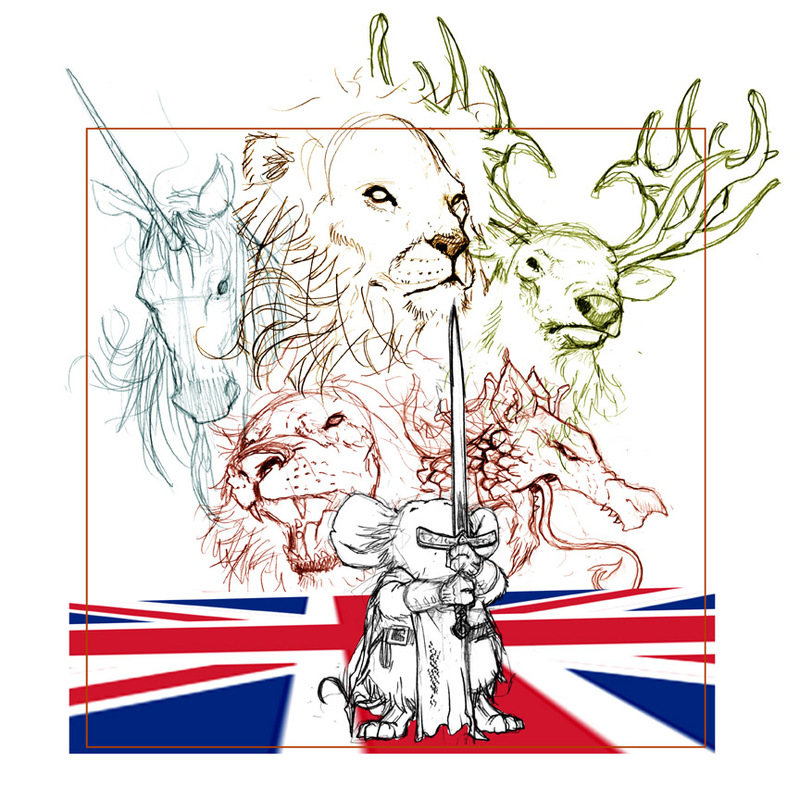 Using the heraldry of the countries that make up the UK (Lion: England, Unicorn: Scotland, Elk & Lion: Northern Ireland, and the Dragon: Wales) I figured a mouse could pay homage to the animal icons of the UK. 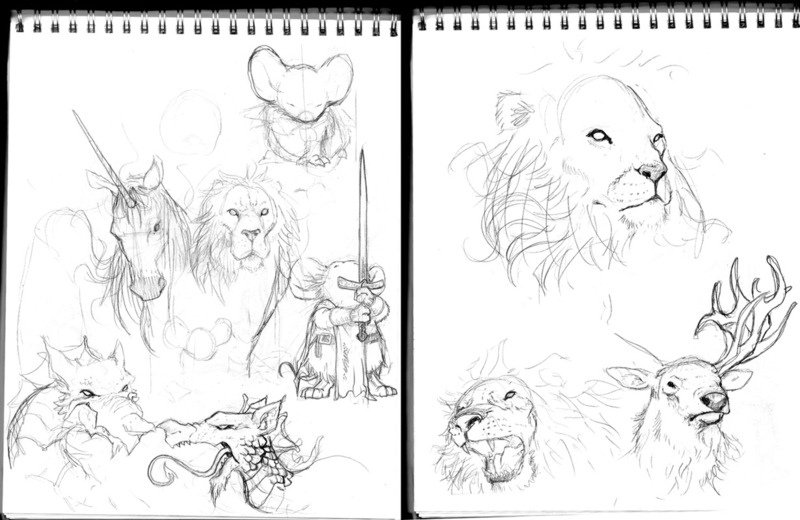 I sketched out the animals looking at reference for the animals as I drew. The sketches were all scanned and assembled in photoshop. 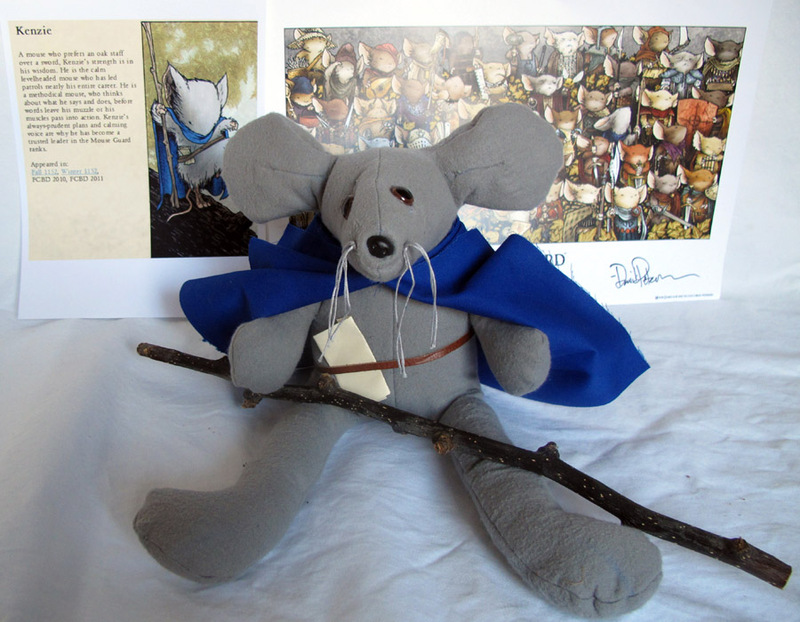 I grouped the animal heraldry into a big mass with the idea of it forming something like a UK Patronus for the Guard Mouse. I resized and rotated my sketches as I came up with the final composition. The tinting was a way for me to easily see which lines belong to which animal. I pasted in a Union Jack flag and distorted the perspective to become the setting of the image. I printed out the layout and placed it behind the 300 series Strathmore bristol board I do my final art on. Using a lightbox I was able to use the layout as a guide to ink the piece. Most of my time inking this piece was to get the animal manes and fur and scales to all swirl together so that it was hard to tell where one ended and the next began. 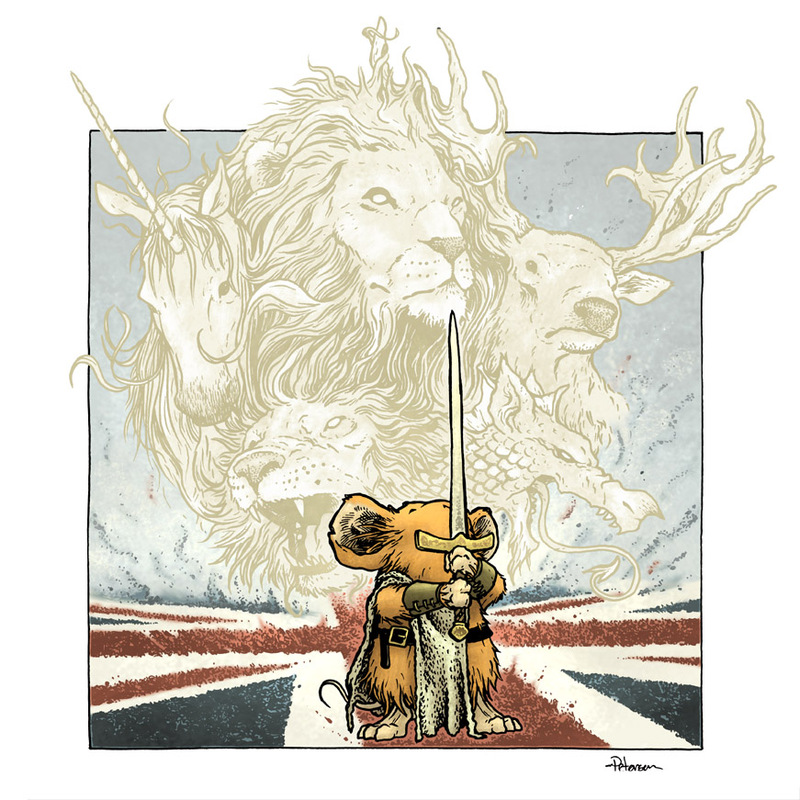 For the Union Jack, I distressed the surface texture as I inked...even making the flag seem to be disolving or being disturbed by the supernatural force of the summoning of the heraldic animals. To color the piece I scanned in my inks, and worked in my traditional way in photoshop 7. Most of the work here was in establishing the various color holds. Color holds are areas where I choose to have the black inkwork display as a color instead of the original black. 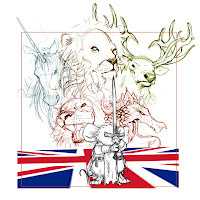 Here I have a color hold on the heraldic animals, the red and blue of the Union Jack and a few small ones on the details of the mouse's sword. The holds help push the animal figures back and to make them otherworldly. It also helped make the flag read more as the Union Jack instead of just shapes. 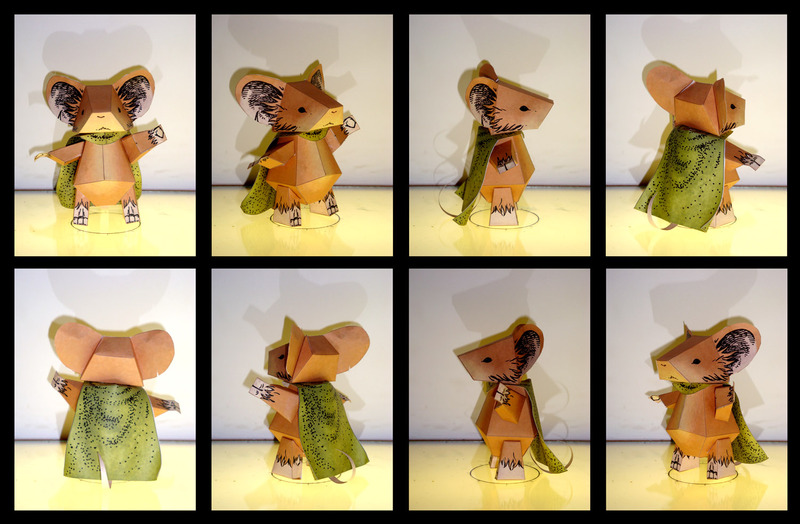 A few weeks ago I was inspired to do a decorative piece of Mouse Guard artwork, perhaps to be used as this year's Sketchbook cover. We have a print in our hallway by French artist Paul Berthon. I thought it would be fun to do a piece completely in homage of this print. 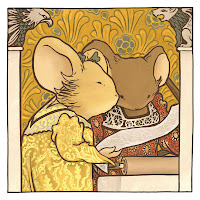 Berthon was a printmaker. So this piece (c.1900), while a print (a lithograph) isn't like owning a print of a painting, it was always meant to be a print. 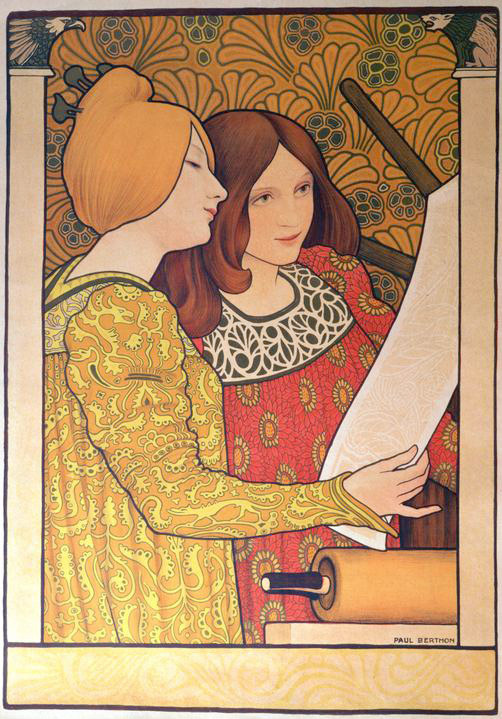 The subject is also of two women examining wallpaper they have just printed on a press. As a printmaking major, I like the piece for these reasons in addition to the aethetics of it. I printed the adjusted digital mock up and using a lightbox inked in the mice in a more stylized manner than I normally do. I focused on the outer contour line, making it thicker than any interior contours, which I kept to a minimum (other that decorative patterning). 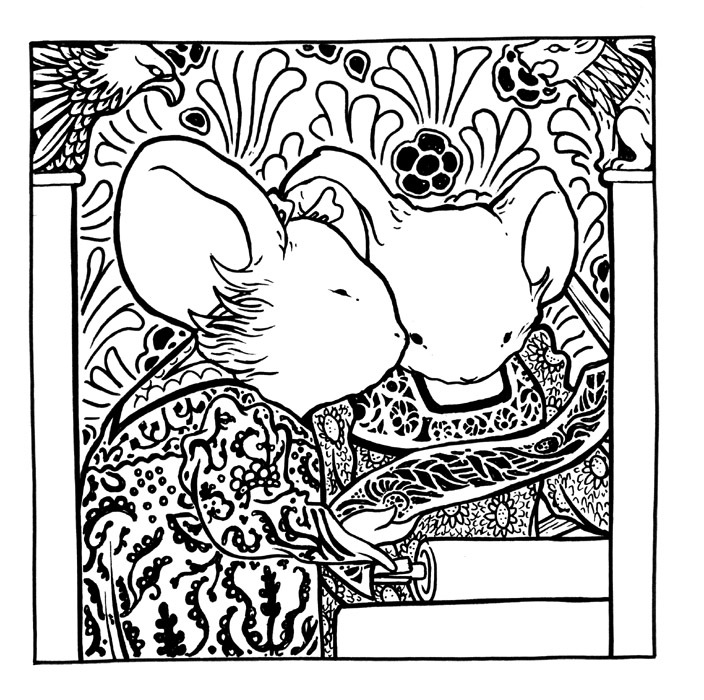 It felt unusual to be inking a Mousey piece like this and not doing any hatching or stippling or texture. The patterns on the dresses and in the background were all drawn onto the bristol as I looked at the Berthon original for reference. The piece didn't come alive until I scanned my inks and colored it. 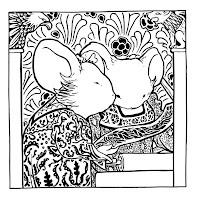 I inked in so many of the patterns dark and thick, that in ink it looks too heavy and clumsy. I color held all of the linework (meaning I used a color overtop of my inkwork to change the lines to a color instead of their original black). This way I was able to soften the dress and background patterns and get a closer sense of the original. 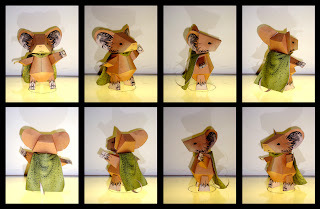 I've done several posts about the models I build out of scrap cardboard and paper to make Mouse Guard locations and sets. 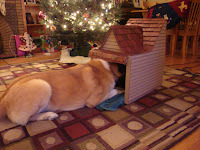 Yesterday I decided that my Sister-In-Laws dog Olive, who is staying with us, needed a little indoor dog house. A past dog of ours, Augie, liked having a little place to hide, so I had made that dog a little box house. I wanted to make something nicer for Olive though (we also didn't want a taped up cardboard box in the livingroom as part of our decor). The house is made of one box with another box or two cut up for the gable roof, the shingles, and the siding. 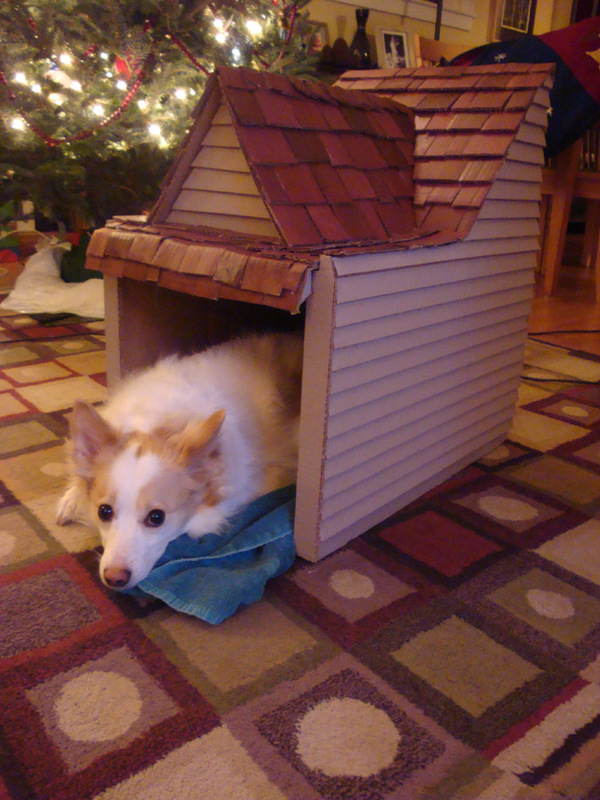 I pre-painted sheets of cardboard before cutting it into strips for the siding. The shingles on the otehr hand, I pre-cut and then painted each one. For the shingle paint I poured a few similar colors into a tray and as I painted changed the color mix on the brush as I went so the shingles would look more random. 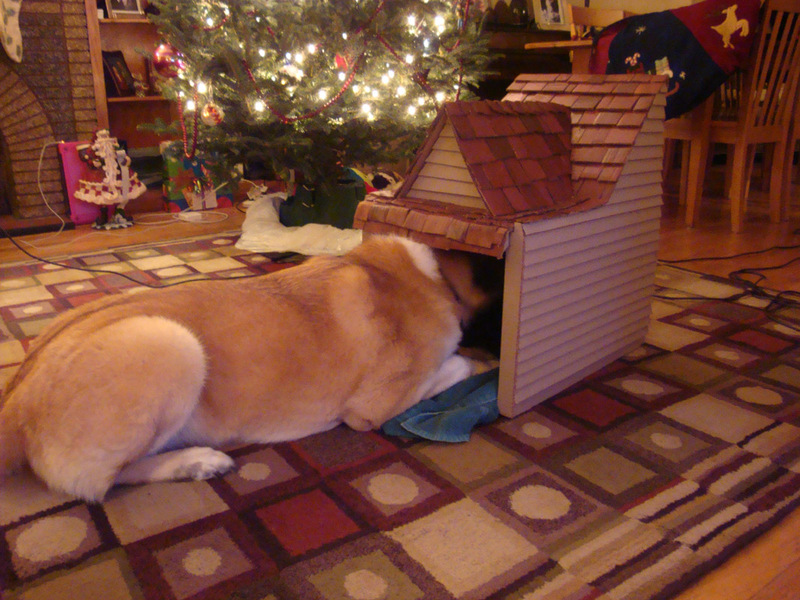 and patchwork, as real shingles can. The benifit of this house, it that it's incredibly light and easy to move if we decide to relocate the house or for cleaning. 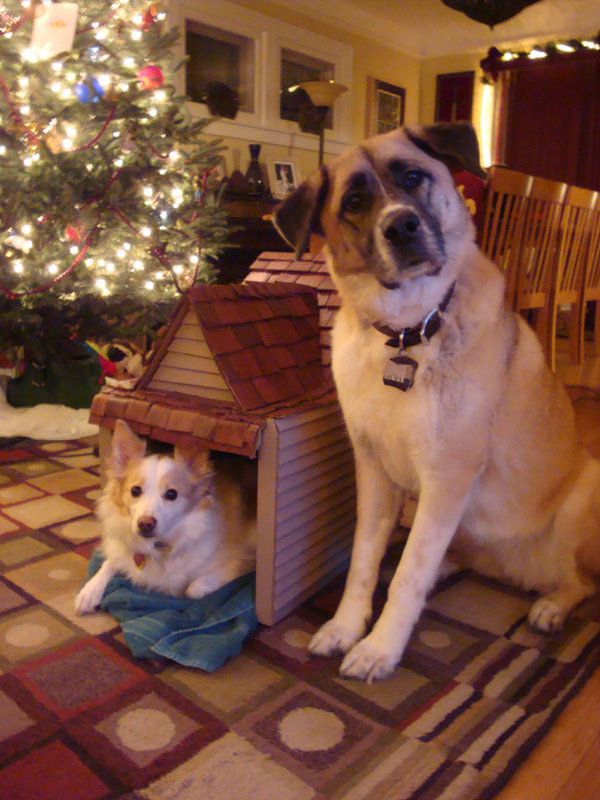 It took a little convincing to get Olive into her new house, but Autumn, our big dog, was ready to move in for her. Autumn is very curious (where Olive tends to be nervous) and seemed rather jealous that I made such a thing for her little cousin. I suppose I'll have to make one for Autumn, though I shudder to think of how big it will be and how many slats of siding and individual shingles I'll need to cut and paint. But it will be a fun project that is a change of pace for my hands from penciling, inking, and coloring. Since this feels like a crafting post, I figured this piece of fan art by Kate Buike seemd fitting. Kate wrote telling me she had just read the Mouse Guard books in December and enjoyed them so much she wanted to make her own plush of Kenzie. The Mouse Pattern she says comes from Carol's Zoo. Thanks Kate! !